Online marketplaces experienced record year-on-year growth of 74.8% from 2016-17, and the retail industry is now in the era of ‘New Retail”, where consumers have multiple experiences with a brand across a number of different channels, Australia Post’s annual Inside Australian Online Shopping report has revealed. The report also revealed that the fastest growing ecommerce sectors are variety stores, fashion, and health and beauty, the fastest growing payment method is Buy Now Pay Later (BNPL), and although ecommerce growth in Australia is strong, the opportunities for Australian retailers to advance internationally certainly aren’t girt by sea. So what are the key insights and trends from this report that you as a retailer really need to know, and how can you take advantage of the opportunities abound? Here are the highlights. Before we dive into the juicy stuff, let’s look at some quick (but no less juicy) stats to paint the picture of how the retail landscape looks now, compared to just a few years ago. 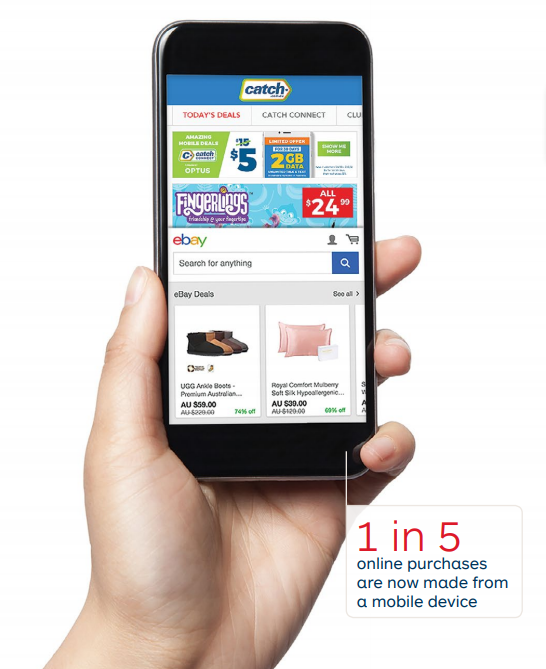 In 2015, less than 10% of Aussies used smartphones to shop online. In 2017, 50% of all online purchases were made via mobile. In 2015 online spending grew by by 6%. From 2016-17 it increased by a huge 18.7% to a total of $21.3 billion. This is in comparison to just 2.5% growth for traditional retail, where Aussies spent $267.4 billion in 2017. In 2017 the number of online purchases are up 19.2% versus an 11.5% rise in 2016. What we’re seeing here are big changes with respect to attitudes and behaviours towards online shopping—the frequency, channels, devices, times and places we purchase—a new era of retail. ‘New Retail’ as Australia Post calls it, is an era where the lines between traditional retail and online are no longer so distinct. Shoppers move quickly and seamlessly between bricks and mortar stores where they touch, test and try (or ‘experience’) products, to the digital world where they browse, compare and purchase items across multiple devices, be it a smartphone, tablet, desktop computer or via voice operated Artificial Intelligence like Google Home and Amazon Alexa. 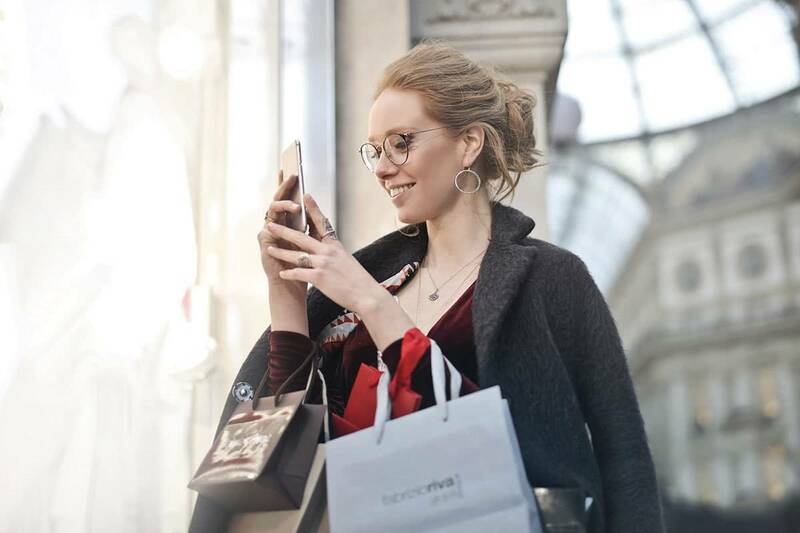 And to meet these changing behaviours, retailers are increasingly delivering ‘omni-channel’ experiences so that consumers have consistent experiences with their brand, no matter what channel they shop on. But whilst growth of online spending is leagues ahead of traditional spending, and the lines between the two are blurred, it’s important to note that traditional retail’s reported $267.4 billion still accounts for over 90% of total retail spend. Think back 10 years ago to a time when the thought of paying for something on your mobile phone was unfathomable, and short of a credit card, LayBy was the only way to pay something off in installments—and you didn’t even get your hands on your tv/cookware/new pair of sneakers until the very end. What type of world were we living in! Now, paying via a phone is second nature for many, and new payment services that allow you to get your hands on a product right now and pay in future installments are growing rapidly, Australia Post reports. Last year, BNPL payments accounted for 7.7% of total online spend and 57% of all BNPL transactions were fashion related, a seven fold increase from 2016. In the 2017 Neto State of Ecommerce Report, we reported a 147% increase in adoption of BNPL methods like Afterpay and zipPay by our merchants last year, and our 2018 data shows a significant increase in basket size when checking out with post pay; an increase of 26% for the motor parts industry, and 19% for electronics! The standout finding from the report was the 74.8% growth of online marketplaces—platforms like eBay, Amazon and Alibaba where goods are offered for sale by multiple third parties. This statistic is in line with the findings of the Neto State of Ecommerce Report, which identified early on that marketplaces were only going to grow in popularity, with 39% of shoppers naming marketplaces as their first preference for purchasing online, over company websites (32%) and social media (7%). Which channels are consumers using to purchase online? Last year we saw a number of new players to the marketplace game—namely Catch and Myer, and this year we saw Chinese ecommerce giant, JD.com launch in Australia and a number of Australian brands, including T2 and Wine Australia launching on Alibaba’s Tmall. Australia Post predicts that not-quite-a-marketplace, Google Shopping, will likely claim a larger portion of the market over the coming years, stealing traffic away from others via Google Search. With increased reach and a smorgasbord of new shoppers, it won’t be long before selling in not just one, but many marketplaces becomes a core part of retailers’ strategies. If you’re interested in learning more about Google Shopping, head over to our recent blog, What is Google Shopping? Each year, shoppers are becoming much more comfortable buying online from a mobile device, with a 58% year-on-year increase in 2017. This is probably due to convenience, improved functionality of mobile websites, and increasing familiarity and confidence in security. So if your ecommerce website is not mobile responsive or easy for customers to navigate and buy, you’ve got some work to do! 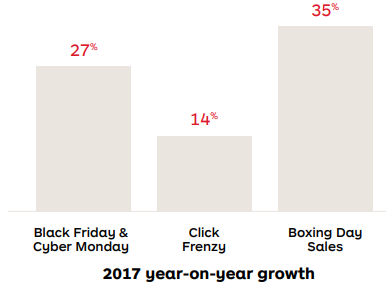 Recently we wrote about the growth of Click Frenzy, a 24 hour online shopping event held four times a year in Australia, which brings in hundreds of thousands of shoppers and huge sales for retailers, and the findings from Australia Post say the same.Following a trend in the US for online-only shopping events like Cyber Monday and hybrid models like Black Friday, Australians have been quick to jump on the bandwagon to bag a bargain, which, in turn is disrupting the traditional seasonal cycles for retailers. So ecommerce in Australia is growing fast, but did you know that 99.9% of all online spend happens outside of Australia? 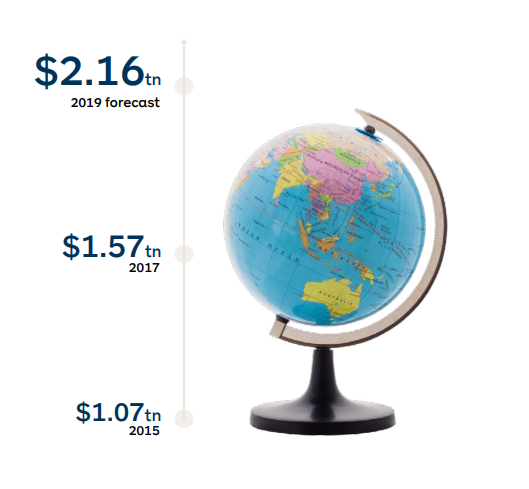 The global ecommerce market is currently worth USD $1.57 trillion and is expected to rise to $2.16 trillion in 2019. Another key trend from the report to be aware of is the shift of buying power from the US and Europe to China and Southeast Asia, signalling big opportunities for Australian retailers to sell their goods—which have a reputation for being clean and green—to our neighbours. China comes in at the top of the list, with an online customer base of 700 million users, $499 billion in potential ecommerce value, and a thriving marketplaces scene with the likes of Tmall, JD.com and advanced social commerce systems that allow consumers to buy directly from social platforms like WeChat. And if you’re thinking of expanding into China the top products are health, beauty and supplements, which we highlighted in our recent post that dived deep into the Supplements and Nutrition market. Although expansion into international markets can seem like a great opportunity to tap into oodles of new customers, proceed with caution; every market is different and what works here might not necessarily work in Malaysia or China. The future of ecommerce is about is growth and expansion; consumers are literally everywhere and to tap into them you should be too, delivering a seamless, consistent omni-channel experience whether it’s online, offline, on your website, social or a marketplace, in Australia, or overseas. The changes we’ve highlighted, from the growth in marketplaces, to online sales events are important markers of where retail is headed, and as Neto is the leading Australian platform for both marketplaces and growth with global expansion in our very near future, our customers are perfectly positioned to grow with us too. Excited for what's to come? Make sure you are prepared with our 2018 Retail Calendar, now updated to include the 2018/19 Financial Year!